Our file storage systems allows creation of file folders in the cloud for storing input, output, working and policy files related to payroll and other processes. The storage facility also enables storage of different versions of each file. 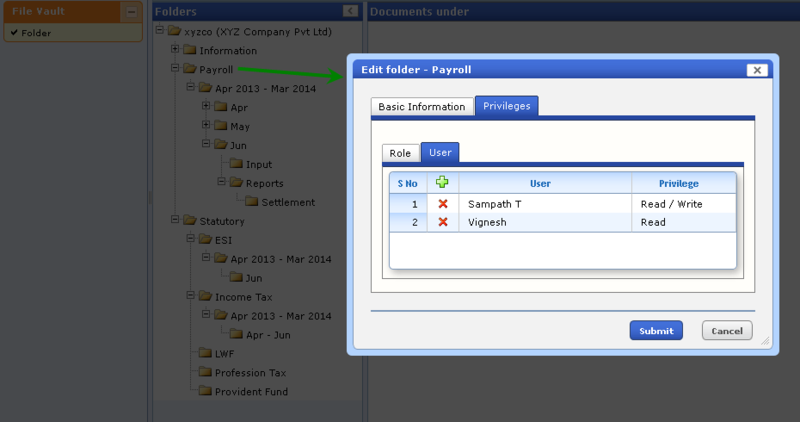 Reports can be published automatically from the file folders, in which they are stored, to authorised personnel. Users who have the “write” privilege can make modifications to the files. Authorised personnel can receive the link, to download published reports, by way of email. Access to file folders is controlled by a robust access-control mechanism. Specific users can be provided with Read/Write privileges while accessing file folders and sub-folders. HRWorks adopts stringent security standards to safeguard customer data stored in its servers. Access all your files at all points in time from wherever you are. Our storage system backs up all your files continually. Even if you lose all the information at your end, you know where to turn to. Access all the files in the cloud from your computer’s file system (for e.g. Windows Explorer) without any security concern. Move files from the local drive to the cloud and back with ease. HRWorks takes full advantage of the WebDAV protocol which enables access of files stored in the cloud while maintaining the folder structure and conforming to the access rules specified for the folders.